Packing a battery pack, a GPS receiver, IPX-7 waterproofability into a single case to protect the otherwise svelte iPhone sounds like overkill, but if you're going to put a case on a phone, you should do it right. First off, yes, this case is really big. After you insert your iPhone (or iPod touch, which also fits with an included sleeve), the device becomes nigh-unpocketable, yet retains most of its functionality. It's not so big or so heavy that you have a problem carrying it around, but it is about three times as thick as an iPhone 3GS. Which means it's going to be 4 times as thick as the iPhone 4. 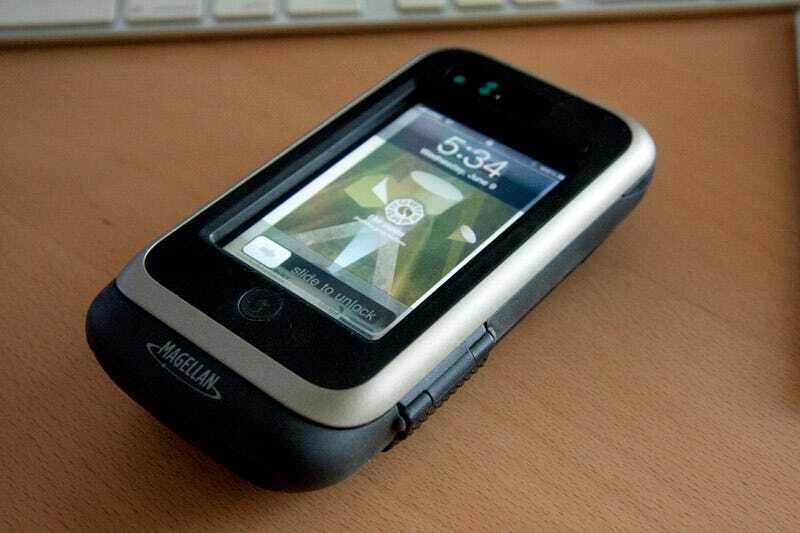 And yes, they will have a version for the iPhone 4. You can still access the screen through the touchscreen layer, still talk on the phone as normal, still listen to music (but the line-in microphone stops working), still access data through 3G/Wi-Fi and still use the on-board GPS or the GPS in the case itself, which is more accurate than your 3GS/3G's chip. At $200, it's somewhat of a niche product for construction workers, hikers, bicyclists, sailing enthusiasts, people in dirty conditions and just plain clumsy folks who drop their phones and need extra protection. The battery pack, GPS and indestructibility are all very welcome additions, but an extra $200 to the cost of your iPhone might not be worth it to everybody. However, for iPod touch users, this adds the ability to use those App Store turn-by-turn driving directions, turning your iTouch into an actual navigation device. That, plus the battery pack, definitely justifies the price. The water-proofability, letting you hold it at 1-meter for 30 minutes, really makes bath time all that more enjoyable for everyone. And since it's Magellan, they have vehicle mounts, belt-clips and other accessories for it coming down the line. It depends on whether you're one of these specific markets that really need it. The ToughCase is so specialized that you should immediately know if this appeals to you or not. iPod Touch users who are in need of a GPS (but don't want to buy an iPhone for it) are in that camp. So are iPhone users who need extra battery life and tend to drop their phone all the time. So are giants with huge pockets. Once they can get the price down on the product a bit—after they ramp up manufacturing and sell a bit of these—it'll be more tempting for people who don't need it all the time. Those who just want to carry their phones on a trip to the beach, or to the pool, or out on a hike where there isn't great GPS reception.